How can God punish Adam for something as insignificant as biting into a fruit? Jesus-Islam » Morality » How can God punish Adam for something as insignificant as biting into a fruit? What is so bad about eating the fruit? 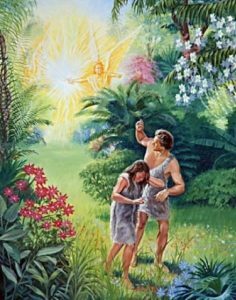 When Adam and his wife took the fruit of the tree of the knowledge of good and evil, they committed a serious sin (Genesis 2: 16-17; 3: 1-6). It was not the fruit that made this act serious, but the fact that by eating it they expressed what they thought of God and how they behaved towards Him. This one act betrays a whole series of attitudes and motives: selfishness, arrogance, wilfulness, rejection of God, loss of love for God, and more. We see that eating a small fruit in this case is a serious insult to God. Through this one act, Adam refused to acknowledge the goodness, authority, truth, worth and wisdom of God. He literally rejected God and broke the covenant that existed between them. It is the same attitude we have in our lives today. It was right that God punish Adam for this sin. In these verses we see the seriousness of sin, but also a promise that ‘seed’ of Eve would crush Satan, but that Satan would ‘bruise his heel. But we also see that while Adam and Eve tried to cover themselves with something they made from leaves, God made them clothes and coverings from an animal skin. The animal died and they as sinners were covered. It is the first promise concerning the Messiah, and the first picture showing what He would do. His ‘covering’ would be given to cover the sin and shame of men and women. They cannot make amends for their own sin. The sacrifice died. They were covered. Those who know the rest of the Torah and the writings of David and the prophets, know that this theme of a sacrifice needing to die so that sinners can be accepted, prepares the world to know that God treats even one sin so seriously that we do not need a teacher to tell us to try harder and do better. We need a Saviour who will pay the eternal penalty for our sins. The Torah prepares us for the Messiah who was the Lamb of God. Our is covered by His perfect and sinless righteousness as we trust Him.